Men's Journal published its list of 50 Most Adventurous Men. Without a doubt, these 50 men are daring, courageous, and audacious whose lifestyles are unique and mindsets are rare. The list includes adventurers who focus on mountains like climbers (Alex Honnold, Mike Libecki, Erik Weihenmeyer, Ueli Steck, Tommy Caldwell, Dean Potter, Conrad Anker, Renan Ozturk), skiers (Cody Townsend, Chris Davenport, Jimmy Chin, Matthais Giraud), and snowboarders (Jeremy Jones, Travis Rice). The list includes land-based explorers like an environmentalist (Wade Davis) and scientists (M. Sanjayan, Chris Begley). The list includes a myriad adventurers of the terra firma (Colin Angus, Mike Horn, Mike Horn, Eric Larsen, Levison Wood, Bill Stone, Gregg Treinish, Erden Eruc, J. Michael Ray and Sebastian Copeland) as well as a cyclist (Danny Macaskill), a walker (Karl Bushby), runners (Anton Krupicka, Kilian Jornet, Kenton Cool, John Grunsfeld, Will Gadd), rescuers (Chhiring Dhenduk, Siddarha Gurung), and a storm chaser (Geoff Mackley). The list includes those who prefer to deal in the sky and high places like a tight-rope walker (Nik Wallenda) and base jumper (Felix Baumgartner). The list includes watermen like surfers (Greg Long, Laird Hamilton), kayakers (Tyler Bradt, Aleksander Doba, Ben Stookesbury, Chris Korbulic), a paddler (Mark Kalch), a submariner (James Cameron), shark conservationists (Greg Skomal, Chris Fischer), and free diver (Guillaume Néry). But the list only includes one swimmer, Lewis Pugh. While we understand the majesty of snow-covered mountains, dense jungles, inhospitable deserts, sheer cliff walls, and outer space, and the creative boldness of watermen who use equipment like surfboards, paddle boards, submarines and boats to push the envelope of what is possible, two men in this list stand out in our minds: Guillaume Néry and Lewis Pugh. In terms of equipment and gear, they are least armed of the world's 50 most adventurous men when they step off the shoreline. No clothes, no protective gear: they are suited up with the most basic covering around their private parts and eyes. Like many others on the list, they can be easily killed and certainly injured in any number of ways. But like their fellow adventurers, they take calculated risks after careful planning and intense training. 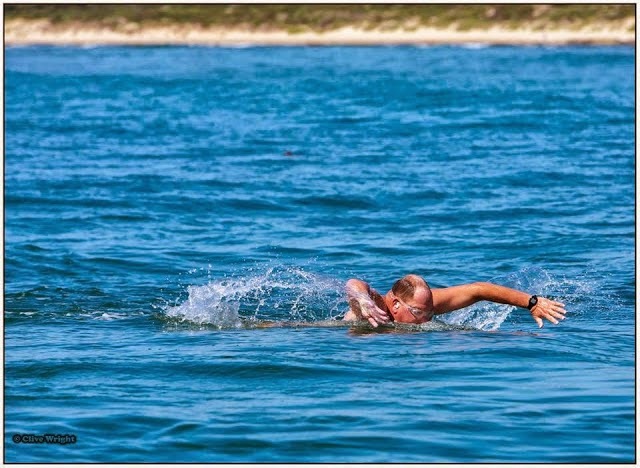 But the Daily News of Open Water Swimming did its own research and compiled the following list of the 2015 World's 50 Most Adventurous Open Water Men, listed alphabetically by last name. "The list includes men from 19 countries including England, Mexico, Australia, South Africa, Tunisia, Russia, Italy, USA, Ireland, Dominican Republic, France, Spain, Estonia, Serbia, Argentina, New Zealand, Bulgaria, Slovenia, and Germany which is indicative that the sense of adventure in the open water is global and inherent among many," explains Steven Munatones. "There are simply thousands of men who have done ocean, lake and river swims that are off the charts. But this list is symbolic of the very best, the crème de la crème. For example, what Cyril Baldock and Dr. Otto Thaning are doing in their 70s is remarkable and what Ram Barkai, Andrew Chin, Kieron Palframan, Ryan Stramrood, and Toks Viviers did in Patagonia was mind-boggling. Same with Nejib Belhedi who swam along the coast of Tunisia or what Vito Bialla is doing out to the Farallon Islands or what Salvatore Cimmino is doing with one leg or what James Pittar is doing without sight. Their accolades go on and on, but one thing appears to be true: these men like Craig Lenning and Pádraig Mallon are quiet, humble innovators in the open water, inspirational to many." Adventure involves not only the difficulty of the swim itself, but also the creativity of the course and uniqueness of the location. But toughness is one critical and fundamental element to be named on the list. "Personal toughests for me were our Antarctica one-mile swim in 2014, the attempt of the solo Russia-USA crossing last year, the English Channel, Patagonia Extreme Cold Water Challenge, and earlier on, my attempt with a bunch of Taiwanese to swim from Taiwan to China," recalls Ryan Stramrood, one of the many South Africans on the list. Each of these men are true heroes, for various reasons. Salvatore Cimmino, who is a disabled amputee, explains his extreme swims around the world, "I dedicate my efforts and this appreciation [for my swims] to the voicelesses because it's not only an award for me, but also for all persons with disabilities who daily struggle for their rights." The list of the World's Most Adventurous Open Water Women is here.